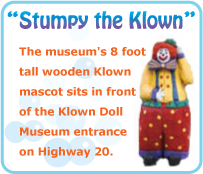 The Klown Doll Museum of Plainview, Nebraska is home to over 7,000 klown dolls! Has a clown ever made you smile? That's what clowns are all about! Come visit the Klown Doll Museum . . . we hope it adds a smile to your day!